Coconut and olive oil have long been superstars in the world of hair. But there’s one oil which is even better. Castor oil is the superfood your hair needs today and every day. The benefits of castor oil are endless but here are a few reasons which should be enough to convince you of its superpowers. If you have thin hair or hair loss, use castor oil for at least six months and see the difference. Your hair will be longer, thicker, and will grow more evenly. Frizzy hair is a pain in all seasons. Whether it’s the wet monsoon or the dry winter, frizzy hair is difficult to handle. Regular use of castor oil will tame the frizz and, if you have curly hair, it will also define your curls. A harsh winter or summer can bring that dreaded dandruff and itchy scalp with it. Since castor oil is heavy and loaded with nutrients, it gives your scalp that much-needed moisture and TLC. You will notice the difference in itchiness and dryness after one use. That’s how effective it is. But be careful not to use a harsh shampoo to wash it off. That will negate the castor oil’s effect and make your scalp dry again. Apart from your flowing mane, castor oil can also thicken your eyebrows and eyelashes. Apply a small dab of it on your eyelids and your brows every night. Wash it off in the morning. Over a few months, you will notice that your brows and lashes look thicker. For most of us, oiling hair twice a week is a major pain. No one has that kind of time in the middle of the week and the health of our hair suffers because of it. However, you can get away with oiling your hair just once a week if you use castor oil. Leave it on overnight or for the whole day on Sunday. On Monday morning, your hair will be the envy of the entire office. Castor oil is extremely thick and viscous. You may not be able to or want to use it in its original form. But there are ways to get around that problem. Since we don’t want you to lose out on the benefits of castor oil, here are a few hair oil mixes and masks you can make with it. The almond and coconut oils serve two purposes here. One, to thin out the castor oil and the other, to add more nutrients to your hair. You can also choose just one of these oils. Mix as much almond oil as you need to make sure the castor oil will spread evenly and not feel too heavy on your head. Leave it on overnight, if you can, or at least half a day to get the maximum benefits out of this oil mix. Add methi seeds and heat the oil for more nutrients. Mix castor oil with conditioner, honey, yogurt, and olive oil. This is a magical hair mask which adds instant shine and bounce to your hair. Put only as much conditioner as you would apply normally after a hair wash. The olive oil in this mask is mainly to make it more pliable. Honey and yogurt come with their own set of nutrients for the hair. Apply this hair mask before a hair wash, and leave it on for 30-45 minutes. You will need a shower cap or towel to wrap around your head so that this sticky mix doesn’t drip on to your clothes. For this hair mask, you will need access to an aloe vera plant. Cut off one of the leaves from the bottom of the plant. With a sharp knife, cut off the thorny sides and the top green layer of the leaf. This should expose the gel inside which will be super slippery and slimy, so be careful. Cut off the gel in a way that it separates from the leaf completely. Wash the aloe vera gel well enough to make it transparent. There should be no yellow or green spots. Take out a spoonful and store the rest in a jar in the fridge. Mix castor oil and aloe vera gel in equal parts, and apply it on your hair. Wrap a hot towel on your head, and leave it on for 30-45 minutes. This is the easiest way to use castor oil on your hair. The water dilutes it enough to make it easy to apply while keeping it thick enough to make sure you reap the benefits of castor oil in their entirety. Add two portions of water to one portion of castor oil, and mix it well. Leave this oil mixture for as long as you can – overnight or a couple of hours. Since the oil is already diluted here, it’s easier to wash off. If you have dry hair which is crying out for moisture, this is the best mask for you. Add a 4-5 drops of glycerin to 3-4 tablespoons of castor oil. Mix it well and apply it on your scalp and hair. Leave it on for about an hour and wash it off normally. This will add an extra sheen to your hair and give a deep moisturising treatment to your scalp. Because of how thick it is, castor oil is difficult to wash off. 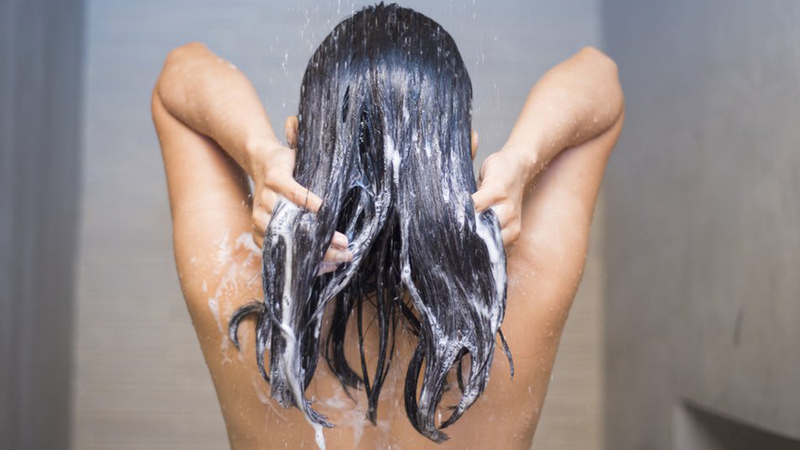 If your shampoo is mild, as it should be, you may have to use other methods to wash castor oil off your hair. Break open an egg and whisk it till its smooth. Massage it into your scalp just before washing your hair. Eggs helps to break down the oil and makes it easier to wash off. Granted, this will be messy but it should be fine if you’re doing this step in the shower. Another way to make sure all the castor oil comes off is to use conditioner on your scalp just before shampoo. Massage the conditioner into your scalp and leave it on for 5-10 minutes. Rinse it off and wash your hair as you normally do. You can buy castor oil from your local market. So, go on and get those tresses in good shape, ladies.